In the historical age, in the Mediterranean dock, traces of little greyhounds have been found. By John Rendell, this greyhound’s breed could be dated back on about 2000 years Before Christ, and since that time this breed hasn’t changed at all. Today we can confirm it, cause in Egypt the skeleton of a little greyhound 5000 years old has been found. The shape and the size of the skeleton’s bones can prove that in 3000 Before Christ little greyhounds were alive. Probably this breed has been moved from Egypt to Greece, as here in Greece we’ve found a little greyhound, or Laconian greyhound. Iconographic studies of this dog make us believe that the Italian greyhound is a refined selection of the Laconian greyhound. The Laconian dog, is very similar to the big greyhound of Creta, and he is a very small size dog, and also in his moves and expressions he is very similar to the Italian greyhound of Renaissance. 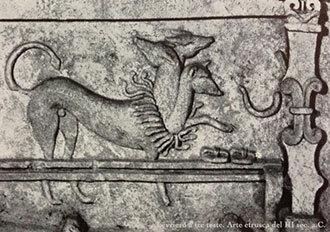 By iconographic studies, we can prove that Laconian dogs were small greyhounds. They have been moved from Greece to Rome, where we’ve found a rich documentation regarding these dogs. Selected through the centuries, especially in Italy, the Italian greyhounds became the unique ancient race of small size greyhounds. Like the Laconian dog remind us of the big greyhound of Creta because of his shape and his size, so the little Italian greyhound remind us of the big satin coat greyhound, because of his shapes and peculiarities, exaggerate and refine them. The long and very thin limbs, the fine and sharp head, the long and arched neck, the lower neck line curved in the thoracic area and concave in the abdominal region, give to this dog an extreme complex of thinness, already an important character of all greyhounds. This dog, example of beauty and elegance, could give the impression of fragility, but in reality he is very strong and robust dog, tireless in the run, energetic, and with a solid body.